On Halloween, Harry Potter’s cutest villain will return with all things pink, feline and evil in her hands. Author J.K. Rowling is releasing a new story surrounding Dolores Umbridge, the teacher who made Harry write ‘I must not tell lies’ with a pen that simultaneously scratched the words into his own hand. Yeesh. 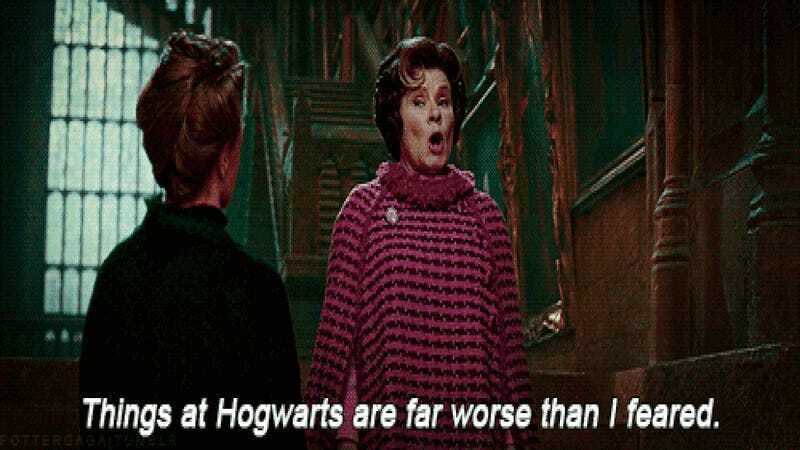 Umbridge’s character debuted in the fifth book Harry Potter and the Order of the Phoenix as Hogwarts’ Senior Undersecretary to the Minister of Magic and the new Defense Against the Dark Arts teacher. Considering her love for kitschy decorative kitten plates, it was a bit surprising when she started firing all of the nice teachers and tried to push out the kind and wise Professor Dumbledore but evil is as evil does. The upcoming story will be around 1,700 words, according to The Hollywood Reporter, and will be a prequel to Umbridge’s time at Hogwarts. Wouldn't we all like to know how Umbridge can like all things cuddly and cute while simultaneously being so mean?